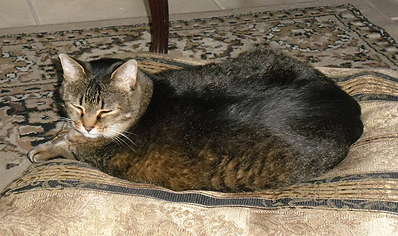 Bizzo lives at the store and is a very large tomcat whose body shape is consistent with Pixiebobs, a hybrid of American Shorthair and Bobcat with the extra stomach of a Bobcat. He is a pro at feline meditation. Ann, Christopher Penczak, and Xyn in front of the "stone room" fireplace in the store. 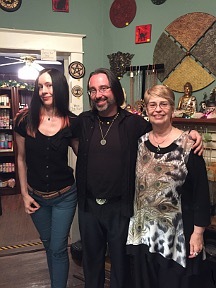 Author Christopher Penczak came to Luna Sol Esoterica for a champagne book signing and presented his workshop, "Witches and Faeries" followed by a meditation to meet your Faerie Guide. 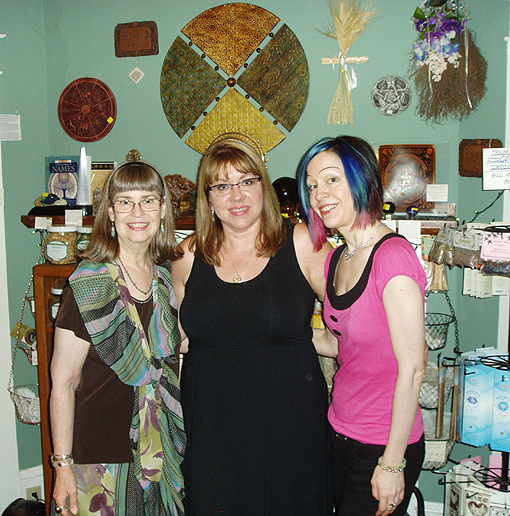 Ann, Ellen Dugan, and Xyn in front of the "herb room" fireplace when Ellen presented her workshop on Magical Herbalism followed by a champagne book signing. 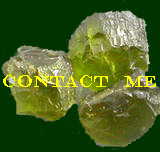 Torre' is a Professional Medium who does private readings by appointment only. She may scheduled for readings with Cards, Palmistry, Past Life, and Mediumship ($50 for 30 minute reading; $75 for 45 minute reading; $100 for 1 hour reading; $120 for couples 1 hour reading). Schedule your appointment and prepay by calling Torre' direct at 321-439-3073. MAY 4 -- SATURDAY (10am - 6pm) -- BELTANE FESTIVAL and PSYCHIC FAIR -- With May Day Rites of Purification and Fertility. Ritual at 1pm presented by Ann Moura and Xyn. VENDORS: Want to vend? 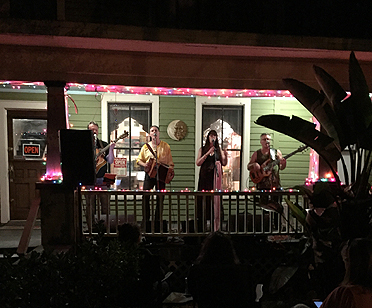 Call the store at 321-363-4883 to describe your product and reserve your place on the porch! Reservations are required. JUNE 22 -- SATURDAY (10am - 6pm) -- LITHA FESTIVAL and PSYCHIC FAIR -- Celebrating the Summer Solstice and Midsummer Magic of Faerie. Ritual at 1pm presented by Ann Moura and Xyn. AUGUST 3 -- SATURDAY (10am - 6pm) -- LUGHNASSADH FESTIVAL and PSYCHIC FAIR -- The Feast of the First Harvest: Bread & Grains. Ritual at 1pm presented by Ann Moura and Xyn. SEPTEMBER 21 -- SATURDAY (10am - 6pm) -- MABON FESTIVAL and PSYCHIC FAIR -- Celebrating the Autumn Equinox and the Feast of the Second Harvest: Fruit and Vine. Ritual at 1pm presented by Coven of the Goddess Moon. OCTOBER 26 -- SATURDAY (10am - 6pm) -- SAMHAIN FESTIVAL and PSYCHIC FAIR -- Honoring the Ancestors and Celebrating the Feast of the Third Harvest: Roots, Squash, Beans, and Livestock. Ritual at 1pm presented by Ann Moura and Xyn. DECEMBER 21 -- SATURDAY (10am - 6pm) -- YULE FESTIVAL and PSYCHIC FAIR -- Celebrating the Winter Solstice and Birth of the God. Ritual at 1pm presented by Ann Moura and Xyn. The eight Sabbat Rituals of the year are child friendly and are presented at 1pm. There is no charge (although donations are certainly appreciated). 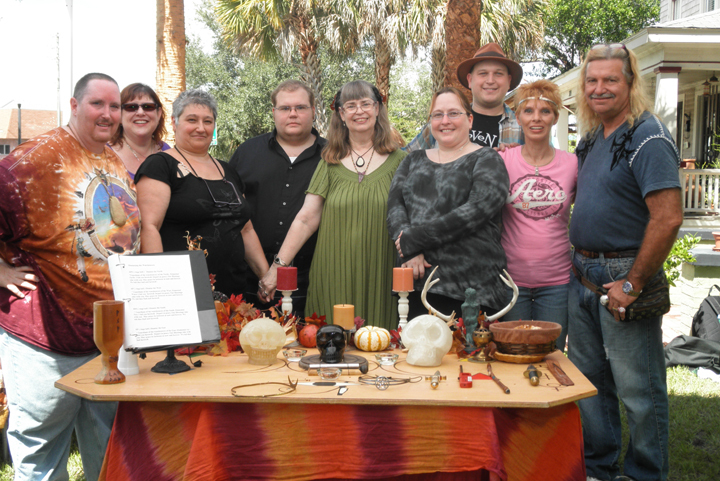 These Sabbat celebrations include day long festivals with vendors, readers, and healers from 10am to 6pm. Seating is available at Ritual; casual attire is fine. For details about each Sabbat, check the listing by date below, or call the store at 321-363-4883. BELTANE -- SATURDAY, MAY 4 -- Ritual at 1pm presented by Ann Moura and Xyn with May Day Rites of Purification and Fertility. LITHA -- SATURDAY, JUNE 22 -- Ritual at 1pm presented by Ann Moura and Xyn, celebrating the Summer Solstice and the Midsummer Magic of Faerie. LUGHNASSADH -- SATURDAY, AUGUST 3 -- Ritual at 1pm presented by Ann Moura and Xyn, celebrating the Feast of the First Harvest: Bread & Grains. MABON -- SATURDAY, SEPTEMBER 21 -- Ritual at 1pm presented by Coven of the Goddess Moon, celebrating the Autumn Equinox and the Feast of the Second Harvest: Fruit and Vine. SAMHAIN -- SATURDAY, OCTOBER 26 -- Ritual at 1pm presented by Ann Moura and Xyn, Honoring the Ancestors and Celebrating the Feast of the Third Harvest: Roots, Squash, Beans, and Livestock. YULE -- SATURDAY, DECEMBER 21 -- Ritual at 1pm presented by Ann Moura and Xyn, celebrating the Winter Solstice and Birth of the God. 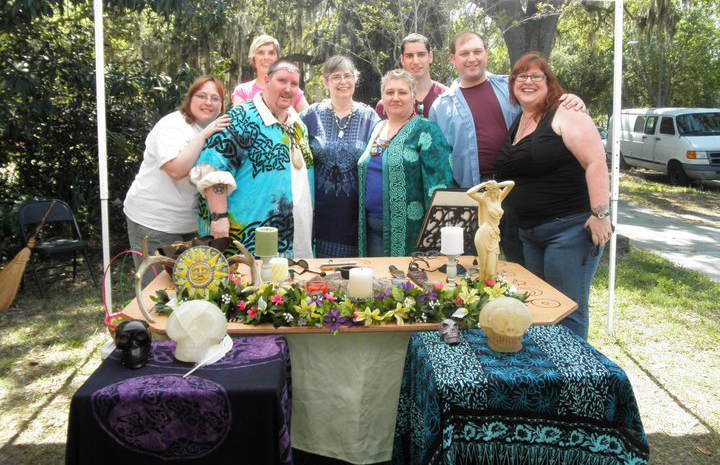 Coven of the Goddess Moon has presented a number of the Sabbat Rituals at Luna Sol Esoterica. This photo is from an Ostara Sabbat. Many thanks, hugs, and love go to Lord Morpheus and Lady Danu and the members of their Coven who have so kindly prepared and presented beautiful rituals! 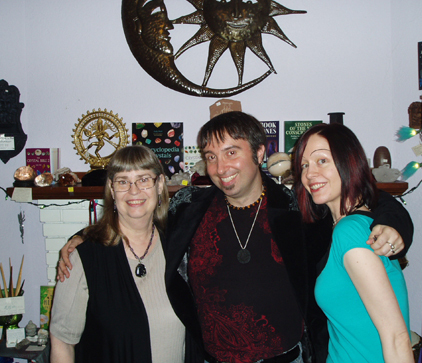 At the Coven's Ostara Altar are Ann (in center), Lord Mage Morpheus on the left, and Lady Queen Danu on the right. The Dropa Skulls graced the Altar for the ritual, compliments of their caretaker, Shaman Jeff (not in picture). This is from a Mabon Sabbat presented by Coven of the Goddess Moon. The Dropa Skulls were placed on the Altar for the ritual by their caretaker, Shaman Jeff, at the right. WAYNE LEE, can be contacted directly for Reiki appointments and scheduling a class. He is a certified Usui/Tibetan Reiki Master, Usui/Holy Fire Reiki Master, Holy Fire Karuna(TradeMark) Master, Sekhem-Seichim-Reiki VII Master. He has been using Reiki for healings since 1999 and teaching all levels of Reiki since 2010. Master Wayne Lee offers Reiki, Aura Clearings, Crystal Healing, and Chakra Balancing BY APPOINTMENT ($40.00 per half hour). 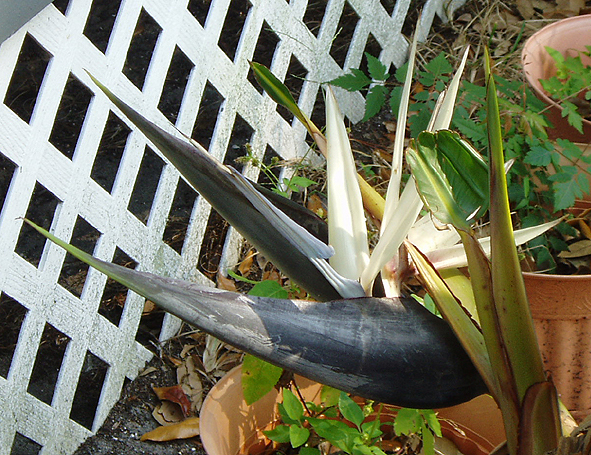 Contact him direct to make arrangements at 352-445-7687 or at wayneleereiki3@yahoo.com for Appointments or to be placed on a Class List for Reiki I, Reiki II, and Reiki III, or call the store at 321-363-4883. Those who have taken Reiki I and wish to continue with Reiki II, should bring their Reiki I certificate. Reiki I is $85. Reiki II is $150, and Reiki III is $225. Reiki I and II can be taken in one day by appointment for $230. Wayne is also a regular healer at Luna Sol Esoterica store festivals, doing Reiki, Crystal Bowl Reiki, and Drumming Reiki. He is most highly recommended by Ann Moura, who has taken Reiki I through Reiki III from him, as well as the Karuna (Trade Mark) Reiki course. Torre' does readings and occasionally teaches classes on a variety of psychic and spiritual topics with the expertise formed from personal experience and training. Classes are listed in the Events section. Her Messages From Spirit sittings open the channels of communication with Spirit and loved ones who have passed, and everyone is guaranteed a message. Schedule an appointment with her by calling her direct at 321-439-3073. WENDY, is an Intuitive Astrologer with over 30 years experience. She combines natural psychic ability with the use of your astrological chart to help answer questions about yourself, your life path, relationships, past/present/future trends, and more. Wendy specializes in Natal, Transit, and Synastry readings, so birth date (and time if available) is needed for an accurate personal chart. Being a natural intuitive, it is not uncommon for messages come through from other sources as well. Prepaid reservation required: $50 for 30 min. ; $75 for 45 min. ; $100 for 1 hour. Call Wendy to schedule your appointment at 321-230-1796, then prepay either at the store or by card at 321-363-4883.